Garage: "Garage: 2 Car Detached; Parking Space(s): 1"
Lot Size: 5748sq. ft. n/a "Rectangular"
Welcome to your energy efficient home! 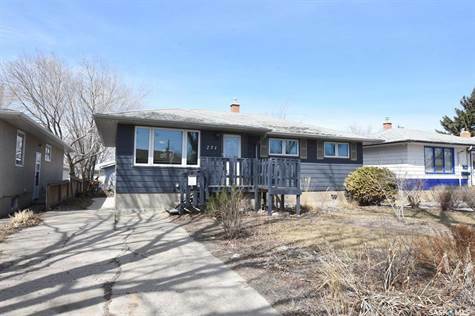 Located on this quiet, mature interior lot mid-block on Froom Crescent. With a high efficient newer furnace, triple pane windows, updated insulation, low flush toilets and a Nest system to run the Nest thermostat, smoke alarms, and security cameras - compatible with Google Home! A warm, very secure home a few blocks from schools, shopping, numerous amenities and easy access to the Ring Road means you are minutes from just about anywhere! \r\nNatural light flows through the living room revealing the beauty of the refinished, hardwood floors. The space feels open to the updated kitchen. Newer high-end appliances come with your purchase! Abundance of white cabinets, newer flooring, subway tiled backsplash and modern, neutral countertops. From the kitchen you can watch your children play in the backyard or you can retreat on the newly completed deck to BBQ and relax after a long day. Once summer hits the perennials will be in full bloom and the mature yard will be one of the nicest in the neighbourhood! The master bedroom is complimented with a second door leading into the updated main floor bathroom. 2 more freshly painted bedrooms complete the main floor. When heading into the basement you will see a project for completion. The recreation room has been insulated, drywalled and is ready for the new owner to finish. Laundry and utility room allow some extra storage. Another 4 piece bathroom is downstairs beside the "teenagers dream" bedroom. Oversized with space to fill! Mother in-law suite? Teenage bedroom? Playroom? Double office? Guest bedroom? What would YOU use it for? Enjoy this bright, truly functional home, gorgeous yard or play in the double, detached garage that is wired for 220 amp. Lots of storage! Lots of parking! Lots of reasons to buy this home and make it yours!